What’s the difference between a prosthodontist and a cosmetic dentist? 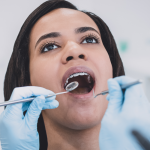 It’s understandable that there’s confusion surrounding this question when many people don’t know what a prosthodontist is, and only have a general idea of what a cosmetic dentist does. The truth is that while these two professions do overlap, they are distinct from one another in important ways. A prosthodontist’s credentials and education are what differentiates their speciality from cosmetic dentistry. 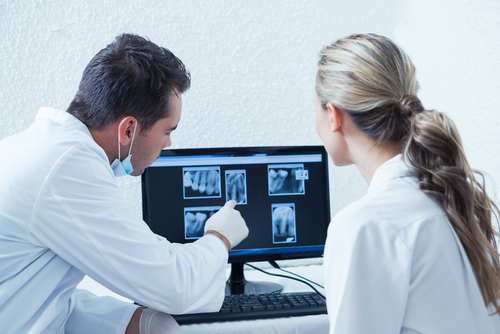 A general dentist can take a few specialty courses in cosmetic dentistry procedures and practice cosmetic dentistry. 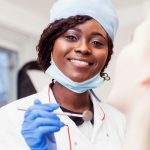 If a dentist is a member of the American Academy of Cosmetic Dentistry, then that means that they have access to ongoing education and training for cosmetic techniques. A prosthodontist, on the other hand, is a specialist recognized by the American Dental Association (ADA) who must complete 3-4 years of training in an ADA-recognized program following dental school. They are professionally recognized as an expert in restorative treatments, which include prosthodontics procedures also associated with cosmetic dentistry, such as implants, crowns, and veneers. The difference is that a prosthodontist is trained to handle the most complex cases. A prosthodontist also differs from a cosmetic dentist in that they are often responsible for leading teams of dental specialists in a coordinated care effort. A prosthodontist may fill the role of being a lead dentist for conditions presenting various dental needs. Cosmetic dentists perform whitening procedures, as this is outside the scope of prosthodontics’ emphasis on restorative care. A whitening procedure lightens your teeth several shades for aesthetic purposes. It’s a great way to “upgrade” your smile without an invasive procedure. Prosthodontists fit and place implants. While some cosmetic dentists also provide dental implant services, prosthodontists have the specialized training needed to guide patients through this restorative process that can take over 6 months. Porcelain veneers are custom-designed to be placed over the front of the teeth to improve their appearance. Both cosmetic dentists and prosthodontists commonly perform this procedure for patients. Prosthodontists will have a more in-depth understanding of dental laboratory procedures and how veneers can be used to improve both form and function. 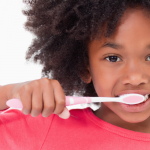 Crowns are placed over damaged teeth for protection and cosmetic reasons. A bridge extends over a gap in teeth to improve stability. Both procedures are commonly performed by prosthodontists and cosmetic dentists. The temporomandibular joint connects the jaw to the temporal bones in the skull, which are in front of the ears. 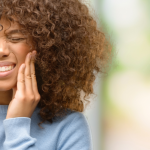 Problems with the jaw or the muscles controlling it are called temporomandibular disorders, which can be due to a variety of causes including clenching/grinding teeth, injury to the jaw, arthritis in the joint, stress, or functional issues. Temporomandibular disorders are exclusively addressed by prosthodontists, being outside the scope of cosmetic dentistry. While this isn’t an exhaustive list, we hope that it allows you to get a general sense of the differences and similarities between prosthodontists and cosmetic dentists. In sum, prosthodontists are highly specialized cosmetic dentists with professional training in restorative dental procedures. Take Advantage of the Prosthodontics Program at Penn Dental Medicine! There are approximately 3,500 practice prosthodontists in the country, compared to 195,722 general dentists. That’s why it’s such a privilege for us to host Philadelphia’s only graduate prosthodontics program. Penn Dental Medicine is the teaching clinic of the University of Pennsylvania School of Dental Medicine, and as such we are able to offer low-cost prosthodontics care to patients seeking cosmetic and restorative treatments. Take advantage of our prosthodontists for your next procedure! To make an appointment at Penn Dental Medicine, please call us at 215-898-8965.